Writing pen specially for Tags, It can remove with eraser to be fixed at the back side of the marker. Our company is enlisted amongst leading and prominent industries for offering a wide range of Corporate Pens. The Corporate Pens we offer are used in colleges, schools, offices and many more places. We offer Standard Parker Vector Ball Pens to the customers that have molded plastic barrel and cap with contrasting stainless rim. Owing to the wide experience of this domain, we are instrumental in offering Cello Techno Tip Pen to our clients. We have been counted amongst the most trusted names in this domain, engaged in offering standard quality range of Writing Pen. 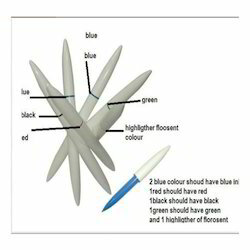 We provide metal body and plastic body Pens, with branding for promotional and internal usage. These are all metal body pens and branding will be done using – CO2 Laser Engraving, to ensure best quality and smooth finish.